Piano/vocal/guitar music is the name given to sheet music arranged for these three instruments. Unless you specifically purchase choir or band music, instrumental music or guitar tablature, you’re probably purchasing a piano/vocal guitar sheet. 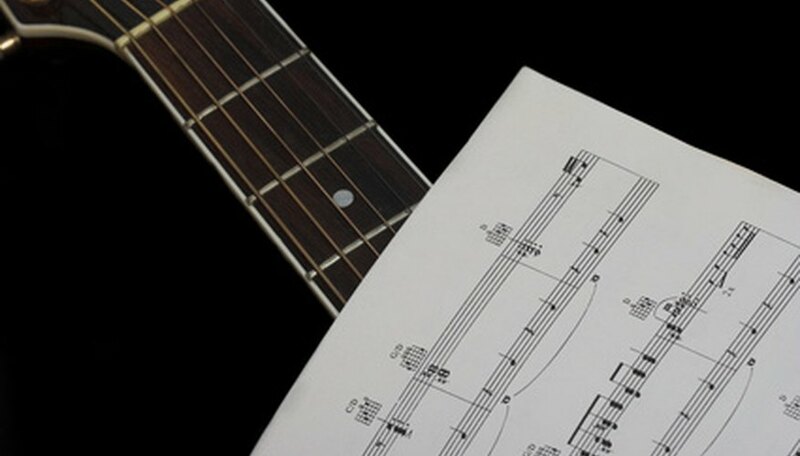 Music transcribers use this standard format to make the sheet music accessible to the widest range of musicians. Understanding how piano/vocal/guitar sheets are arranged will give you the necessary information for playing a song. You can identify whether the sheet music is arranged for piano/vocal/guitar by searching for piano/vocal/guitar on the front cover of the sheet music. Occasionally, just the words piano/vocal are on the front cover. In such a case, confirm whether guitar chord diagrams are written above the music staff. Look at the three staves of the sheet music. The top staff is the melody line, reserved for the vocal part. The song words are written beneath the melody line. Locate the diagrams above the top staff. These are guitar chord diagrams. Each diagram represents the neck of a guitar. Little dots placed on the diagram show the guitarist how to finger the accompanying chords. Notice the two music staves below the melody staff. They are connected together by a vertical line. This is called the grand staff and encompasses both a bass and treble clef. The bass clef is the lower of the two. This is the piano part of the song. Regardless of the type of song or how many instruments are in it, all of the rhythm and bass parts are arranged and condensed so the piano part incorporates them. Look at the beginning of a piano/vocal/guitar sheet. You will see the clef sign (treble or bass), sharp and flat signs (indicating the song key), and a time signature. This indicates how many beats per measure. The music is broken into measures with vertical lines called bar lines. Locate the notes in each bar. Music notes of varying time durations are played, as indicated by the time signature. The total duration of the notes in each bar equals the time signature. A 4/4 time signature (known as common time) has four beats per measure, which can be played by any combination of notes that equals four.